1 A None No Power Seat 1 A is a standard Premium Class seat, having a 3-4 inches higher pitch than the standard Economy Class seats. The adjacent seat is blocked for more personal space. This seat may have limited legroom due to the positioning of the bulkhead. The tray table is in the armrest, making the armrest immovable and slightly reducing seat width. The proximity to the lavatory and galley may be bothersome. There is no floor storage during takeoff and landing. 1 C None No Power Seat 1 C is a standard Premium Class seat, having a 3-4 inches higher pitch than the standard Economy Class seats. The adjacent seat is blocked for more personal space. This seat may have limited legroom due to the positioning of the bulkhead. The tray table is in the armrest, making the armrest immovable and slightly reducing seat width. The proximity to the lavatory and galley may be bothersome. There is no floor storage during takeoff and landing. 1 D None No Power Seat 1 D is a standard Premium Class seat, having a 3-4 inches higher pitch than the standard Economy Class seats. The adjacent seat is blocked for more personal space. This seat may have limited legroom due to the positioning of the bulkhead. The tray table is in the armrest, making the armrest immovable and slightly reducing seat width. The proximity to the lavatory and galley may be bothersome. There is no floor storage during takeoff and landing. 1 F None No Power Seat 1 F is a standard Premium Class seat, having a 3-4 inches higher pitch than the standard Economy Class seats. The adjacent seat is blocked for more personal space. This seat may have limited legroom due to the positioning of the bulkhead. The tray table is in the armrest, making the armrest immovable and slightly reducing seat width. The proximity to the lavatory and galley may be bothersome. There is no floor storage during takeoff and landing. 11 A None No Power Seat 11 A is a standard Economy Class seat that has a misaligned window. 11 F None No Power Seat 11 F is a standard Economy Class seat that has a misaligned window. 12 A None No Power Seat 12 A is a standard Economy Class seat that does not recline due to the Exit Row behind. 12 B None No Power Seat 12 B is a standard Economy Class seat that does not recline due to the Exit Row behind. 12 C None No Power Seat 12 C is a standard Economy Class seat that does not recline due to the Exit Row behind. 12 D None No Power Seat 12 D is a standard Economy Class seat that does not recline due to the Exit Row behind. 12 E None No Power Seat 12 E is a standard Economy Class seat that does not recline due to the Exit Row behind. 12 F None No Power Seat 12 F is a standard Economy Class seat that does not recline due to the Exit Row behind. 13 A None No Power Seat 13 A is a standard Economy Class seat that has some extra legroom due to the Exit Row in front, however also may have limited recline due to the Exit Row behind. 13 B None No Power Seat 13 B is a standard Economy Class seat that has some extra legroom due to the Exit Row in front, however also may have limited recline due to the Exit Row behind. 13 C None No Power Seat 13 C is a standard Economy Class seat that has some extra legroom due to the Exit Row in front, however also may have limited recline due to the Exit Row behind. 13 D None No Power Seat 13 D is a standard Economy Class seat that has some extra legroom due to the Exit Row in front, however also may have limited recline due to the Exit Row behind. 13 E None No Power Seat 13 E is a standard Economy Class seat that has some extra legroom due to the Exit Row in front, however also may have limited recline due to the Exit Row behind. 13 F None No Power Seat 13 F is a standard Economy Class seat that has some extra legroom due to the Exit Row in front, however also may have limited recline due to the Exit Row behind. 14 A None No Power Seat 14 A is a standard Economy Class seat located in an Exit Row. There is additional legroom and additional personal space due to recline restriction of the seat in front. 14 B None No Power Seat 14 B is a standard Economy Class seat located in an Exit Row. There is additional legroom and additional personal space due to recline restriction of the seat in front. 14 C None No Power Seat 14 C is a standard Economy Class seat located in an Exit Row. There is additional legroom and additional personal space due to recline restriction of the seat in front. 14 D None No Power Seat 14 D is a standard Economy Class seat located in an Exit Row. There is additional legroom and additional personal space due to recline restriction of the seat in front. 14 E None No Power Seat 14 E is a standard Economy Class seat located in an Exit Row. There is additional legroom and additional personal space due to recline restriction of the seat in front. 14 F None No Power Seat 14 F is a standard Economy Class seat located in an Exit Row. There is additional legroom and additional personal space due to recline restriction of the seat in front. 2 A None No Power Seat 2 A is a standard Premium Class seat, having a 3-4 inches higher pitch than the standard Economy Class seats. The adjacent seat is blocked for more personal space. 2 C None No Power Seat 2 C is a standard Premium Class seat, having a 3-4 inches higher pitch than the standard Economy Class seats. The adjacent seat is blocked for more personal space. 2 D None No Power Seat 2 D is a standard Premium Class seat, having a 3-4 inches higher pitch than the standard Economy Class seats. The adjacent seat is blocked for more personal space. 2 F None No Power Seat 2 F is a standard Premium Class seat, having a 3-4 inches higher pitch than the standard Economy Class seats. The adjacent seat is blocked for more personal space. 29 C None No Power Seat 29 C is a standard Economy Class seat. The proximity to the lavatories and galley behind may be bothersome. 29 D None No Power Seat 29 D is a standard Economy Class seat. The proximity to the lavatories and galley behind may be bothersome. 3 A None No Power Seat 3 A is a standard Premium Class seat, having a 3-4 inches higher pitch than the standard Economy Class seats. The adjacent seat is blocked for more personal space. 3 C None No Power Seat 3 C is a standard Premium Class seat, having a 3-4 inches higher pitch than the standard Economy Class seats. The adjacent seat is blocked for more personal space. 3 D None No Power Seat 3 D is a standard Premium Class seat, having a 3-4 inches higher pitch than the standard Economy Class seats. The adjacent seat is blocked for more personal space. 3 F None No Power Seat 3 F is a standard Premium Class seat, having a 3-4 inches higher pitch than the standard Economy Class seats. The adjacent seat is blocked for more personal space. 30 A None No Power Seat 30 A is a standard Economy Class seat in the last row of the plane that may have limited recline. The proximity to the lavatories and galley behind may be bothersome. 30 B None No Power Seat 30 B is a standard Economy Class seat in the last row of the plane that may have limited recline. The proximity to the lavatories and galley behind may be bothersome. 30 C None No Power Seat 30 C is a standard Economy Class seat in the last row of the plane that may have limited recline. The proximity to the lavatories and galley behind may be bothersome. 30 D None No Power Seat 30 D is a standard Economy Class seat in the last row of the plane that may have limited recline. The proximity to the lavatories and galley behind may be bothersome. 30 E None No Power Seat 30 E is a standard Economy Class seat in the last row of the plane that may have limited recline. The proximity to the lavatories and galley behind may be bothersome. 30 F None No Power Seat 30 F is a standard Economy Class seat in the last row of the plane that may have limited recline. The proximity to the lavatories and galley behind may be bothersome. 7 A None No Power Seat 7 A is a standard Economy Class seat that has a misaligned window. 7 F None No Power Seat 7 F is a standard Economy Class seat that has a misaligned window. 9 A None No Power Seat 9 A is a standard Economy Class seat that has a misaligned window. 9 F None No Power Seat 9 F is a standard Economy Class seat that has a misaligned window. 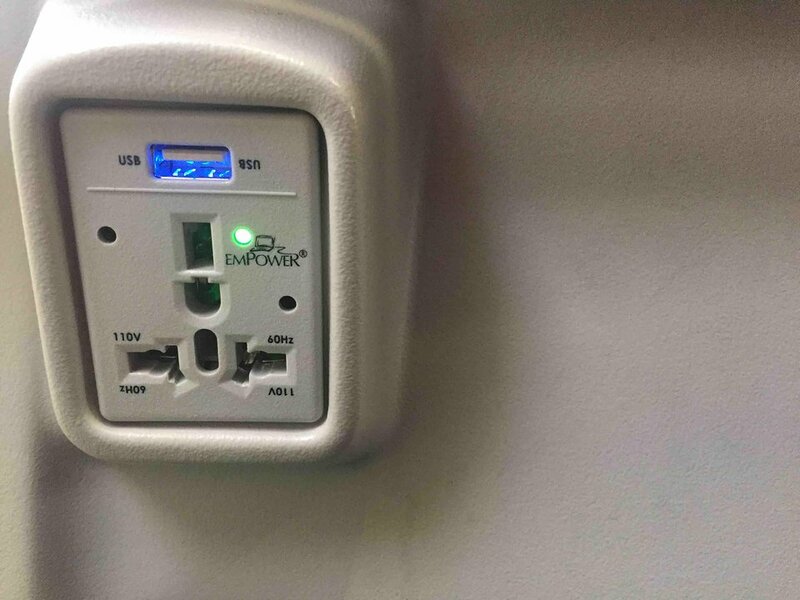 WestJet is transitioning from seatback monitors to a new wireless entertainment system. 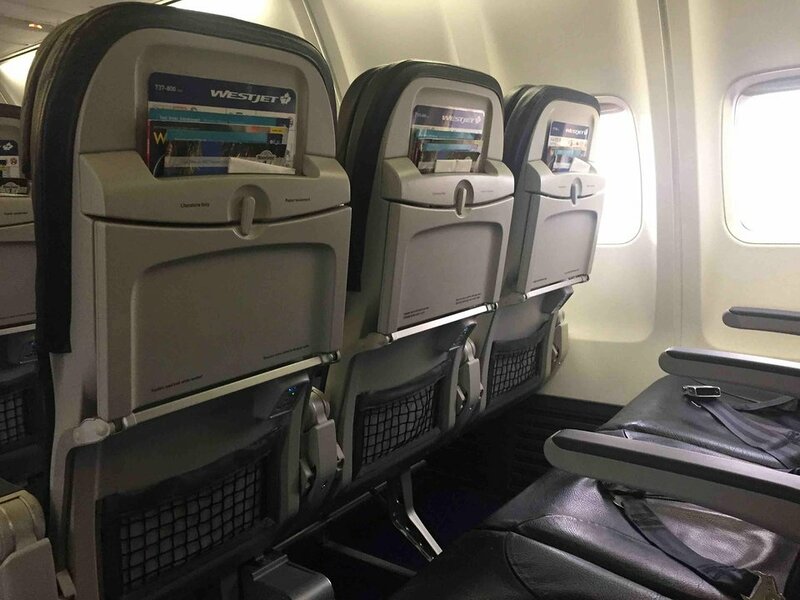 The 737 fleet will be equipped with WestJet Connect, a wireless streaming server with access to over 500 hours of free movies and television episodes and connection to the Internet for a fee. Earbuds are available for purchase on all WestJet flights that offer in-flight entertainment options. Passengers can also use their own earbuds. All 3.5 mm (approximately 1/8 in) stereo headphone connections (with one prong) will work with WestJet systems. Both 110v power and USB power are available to all seats on this aircraft. On all flights over 70 minutes, WestJet is offering a complimentary beverage service which includes soft drinks, juice, coffee or tea, as well as passengers' choice of a sweet or salty snack. The Boeing 737 is the most environmentally friendly model in its class in terms of fuel consumption and noise control. The aircraft are equipped with winglets to provide additional fuel savings. Thanks to its ultramodern computer technology and GPS, this model of aircraft can be steered with great precision and fuel economy. WestJet has operated a fleet of Boeing 737 aircraft since it began in 1996. The narrow-body 737 happens to be one of the best-selling commercial jetliner in history. WestJet currently operates a fleet that spans through the generations of old and new. Latest additions to the fleet comprise of the 600 and the larger 800 series. Both add valuable and necessary flexibility to WestJet Airlines. However, the bulk of its fleet is made up of the Boeing 737-700. WestJet fleet of 737-600, 737-700, and 737-800 aircraft features leather seats and Wireless Entertainment with Internet Connectivity. WestJet's B737-800 operates on short and medium-haul flights and has a 168 seats capacity. The Premium section is located in the first three rows of the aircraft and offer 3-4 inches of additional pitch. Passengers seated in Plus will get advance boarding, first access to overhead bins, and complimentary food and beverages (selections vary). In addition, the Premium fare offers passengers priority screening (at available airports) and the ability to change or cancel flights for no fee. Premium seats offer 4-5 inches of seat recline, Economy seats offer 3 inches of recline. Seat pitch was great BUT passengers began lining up less than 1 hour after take off for front toilet. Flight attendant made them stay behind 3rd row because she was serving "plus" passengers. For the entire duration of the flight I was constantly bumped and hit by people going to the toilet. I do not recommend this seat for any flight more than an hour! there is also no right arm rest. I didn't think i would miss having a right arm rest, until i didn't have one for that flight. This review is for the new 737-800 Max. This is a great aeroplane. The entire appearance of the 'plane is improved, the windows are larger and the 'plane seemed quieter. Seat 20C had plenty of leg room for me (5' 10") - my knees were 6" from the seat in front. I found it quite comfortable even though the seats are all thinner nowadays. The window seats in exit rows 13 and 14 don't have a armrest on the window side. Annoying when you're paying, $40+ dollars for the seat. There are large hard drives bolted on the seat supports under 2C and 2D. That reduces the legroom for seats 2C and 2-D by about 6 inches and it's very cramped. Not Really what you expect from premium seating. Im so sad I didn't take a picture of it for you. 7A gets 2 windows which is better than one regular window so I would definitely chose this seat again. Doesn't bother me that it is "misaligned". The view is still great if not better ! Typical WestJet - subpar in most if not all areas plus now (like everyone else) they upcharge for every little thing like seat selection, 1st checked bag, air, water, gravity, lift, etc. The plane was full, and we boarded last, so got to sit in the Plus seats for free. The Plus seat isn't much different than the regular seat. Only that there's a tiny bit more legroom, but since it's bulkhead, there isn't underseat storage, and the tray table is in the armrest. Since it's close to the washroom, there may be lots of people wanting to use it. There were no individual screens on this particular airplane. This is a great seat. Plenty of leg room as it is the exit row. Well worth the extra money if you are 6' or taller. DO NOT PAY EXTRA FOR THIS SEAT! We were on the red eye special from Vancouver to Montreal and I paid extra in the hope we may be able to stretch out and get some sleep. You do get extra leg room - granted! But the seats are hard, there is no extra recline AND THE WORST is that the seat in the middle has a permanently fixed 'table' which means you cannot put the armrest up and use it to stretch out over. I feel you have less seat width than in economy!! And they could at least put their arm rest up! Several even managed to get a whole row to themselves and could lie flat!!! There was no way you could do this in the Plus seating even if you had the whole row! Will never fly WestJet again! the tray is in the seat in front and there is under seat floor storage. I am a 6 foot male and chose Air Transat's Option Plus so I would have the most amount of leg room. The seat cost should be discounted due to the small and uncomfortable seats. I will be flying AT163 in 2 days. If this seating is similar, then I will never fly AT again. The model indicated 737-800 but we ended up flying a 737-738 I think. Transat should have notified the passenger of this model change. Recently on a flight to Cuba we booked Option Plus with Air Transat and chose the seats 1 A,B and C because the booking agent said they had more room. They only have more leg room, the seat width is ridiculously narrow, & the bulkhead too low for an average size person (5'7") for someone over 6' it is impossible. My mother is very slim and barely fit into the seat, her shoulders were wider than the seat. Seats in row 1 are only acceptable for very slim, petite people and children. Tons of legroom (even more than Plus seating up front) and the fact that the row in front doesn't recline makes it even better. The comments on the seat indicate that the tray table is in the arm rest...it's not. However, window seats in this row do not have an arm rest on the side closest to the exit door. Lots of legroom in this emergency row seat. 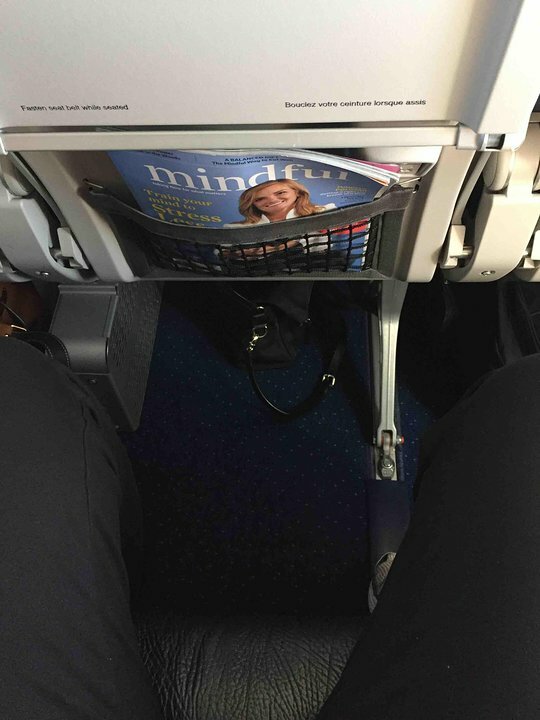 I am 6' 5" and had about three inches from my knees to the seat back ahead of me. One gripe: The seat was rather uncomfortable due to the lack of padding. Premium seating with 2 windows. Plenty of leg room. The center seat isn't missing, just has a tray table add on that is buckled in and secured rightly. It has a "padded" area for your elbow and extra drink holder. While one elbow has economy space room, the other has premium. Next time I'll be sure to get the window on my left side since I am right handed. Free meal, premium snacks, and premium drinks. Definitely worth the last minute upgrade. First I thought I would have a personal TV But I did not get one from LAX-YYC But the drinks were great and I liked the cookies and pretzels for snack. The food and drinks were great. I just wish had a TV when I was boarding in Los Angeles. We were unsure which airline to use for flights between Vancouver and Honolulu so flew out using Air Canada Rouge and back on WestJet. WestJet wins all the way! Our seats were comfortable (unlike AC Rouge), leg room really good and service was friendly. WestJet every time from now on. While you get to avoid having someone in the middle seat because you are in plus, the stupid booster seat they fill the seat with is a waste of space. I was travelling with my girlfriend, while we essentially sat apart due to the spacer, neither of us was able to stretch out or really use this space in anyway. Better than economy...yes, but certainly not any form of first class and would benefit from having better seating instead of just decommissioning the middle seat. 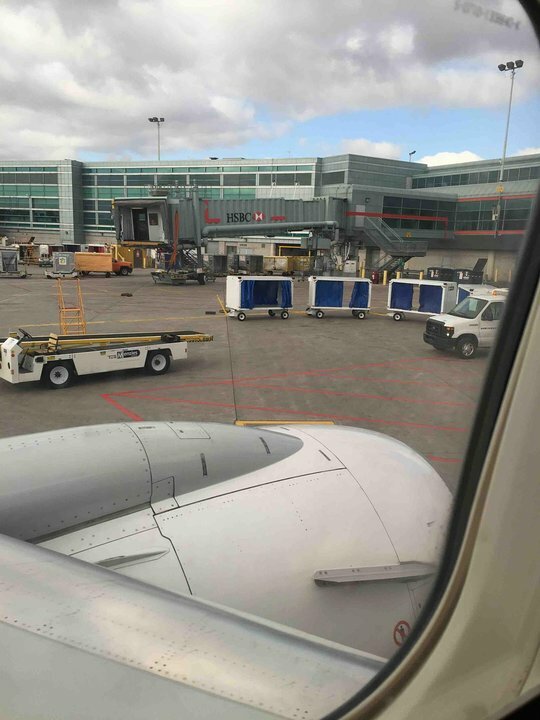 There is no seat back screens in any of the fleet of West Jet planes now. They have all been replaced with personal playback units for rent. They are free in Plus seats. They have movies and television shows. 8C has less floor room for your small bag due to some equipment box between seats B and C. This also seems true for other *C and *D seats in nearby rows. This is my favourite seat on this aircraft. The economy seat pitch makes them very uncomfortable and I'm only 5'2". The Plus is definitely worth the money for long hauls. This 737-800 had no Tv ,no radio/music channels it was a 3 hour look out past pax in 18A or reread the the newspaper for entertainment, but the airfare was no less. Next time Air Canada. Peter Archer. Oliver BC. I was on one of the newer 737-800 that had no seat back TV's, but it did have in seat power & USB outlets, WIFI entertainment system and internet access. It was great. They offered 15 mins of free internet access as a trial, but I was able to relogin several times after the 15 mins were up, with no charge. I missed having the real time map showing our actual location, but I was able to track the flight progress on flighttracker website once I logged into internet access. After 2 bad experiences on Wesjet due to most uncomfortable seats (people in front reclining their seat and making your 4 hour trip a trip to the torture room), I booked a ''Plus'' seat. Third time lucky, the chap in front came down as soon as we took off and moved so much that he knocked down my glass of red wine and it came down all over my trousers....how wonderful! For my return trip, I got my money back from Westjet and booked on Air Canada....what a relief! The legroom is much narrower than the old plane. I try very best to check in right before 24 hours in order to get the exit row. I think the legroom is 1.5 times longer than the regular seat. Even if I cannot get the aisle seat, I would rather stick in the middle seat in an exit row instead of an aisle while company paid $20 to reserve an aisle seat. Plus everyone is trying to get room for overhead storage,having sit in exit row will entitle yourself to get on the plane first. The struts that support the seats are not aligned with armrests as a previous reviewer mentioned. The effect is the window seats have unobstructed foot room that goes under the middle seats as well. The middle seats have generous foot room at the expense of the aisle seats but the outboard strut can get in your way. However, on planes with the entertainment system in the seat backs the middle seats lose a good chunk of foot room for the system. Finally the aisle seats have pathetic foot room as the inboard chair strut is quite far under the aisle seats and there is a metal rail under aisle seats as well to keep items stowed under seats contained. If you are short and don't need to store things under the seats this won't matter to you. However for taller travellers or those with larger items to stow under the seats the aisle seats are much less desirable particularly on longer flights. Other than that the seats lack lumbar support which if not addressed, again particularly on longer flights, can become an uncomfortable issue. And I would have to agree with Airbus comments that seats should never be less than 18" wide. The seats on this new plane are horrifically uncomfortable. 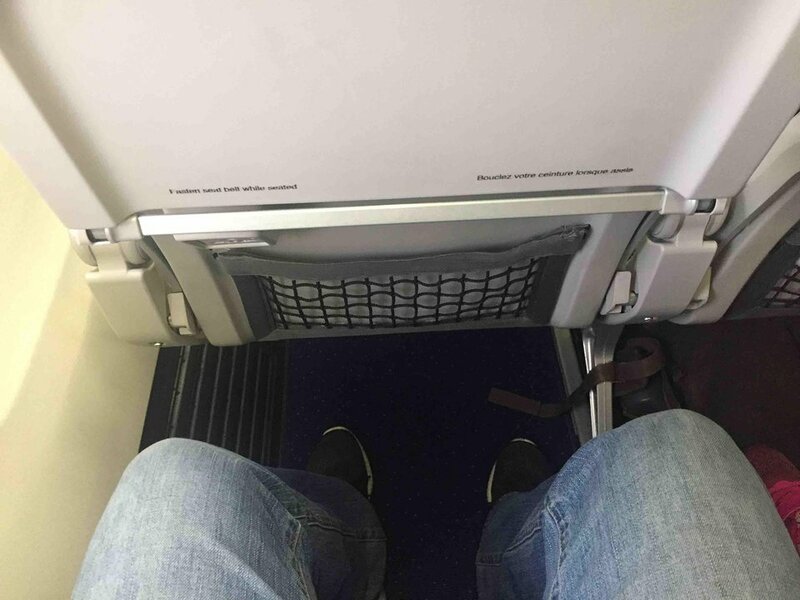 The legroom was not the problem. The pitch of the seats is such that by the end of a 3 hour flight I had such a stiff neck that lasted 2 days into my holiday. The fact that row 12 does not recline made matters worse as there was no way to relieve the effect on your neck. On our return flight, i had a seat that could recline but unfortunately could not recline it as the person behind me was over 6 feet and I would not do that to him. Will Be avoiding this new plane at all costs. The new plane I was on had the new thiinner seats and no in-seat TV's. We upgraded to Plus for the legroom, which was ok, but the rest.....wow. I don't know what they have done to these seats, but there were the most uncomfortable seats I've ever had on a plane. Is the seat shorter? Are they more upright? Less padded? I think it's all of these. I can't pinpoint what is different, but it was a torturous trip. I can't imagine a trip longer that 3 hours in these seats. All C and D seats on this plane have a space about 1 foot wide for the "personal" item and their feet under the seat ahead. All A,B,E,F seats have a space almost twice that size. Very uncomfortable trip especially when the big fellow beside me spilled his scotch on me even though he had all the room! They won't let you use the Economy plus washroom and it's a long walk to the back of the plane. 3A is a Plus Seat and these seats have amazing legroom, they are definitely worth paying the extra money, especially on any flights to Mexico or Hawaii where the flights can run anywhere between 4 and 7 hours. They run anywhere between $40-$60 per seat depending on the flight length. Best pay for the seats when checking in if there are any left instead of buying the Plus Seat when purchasing your fare, you'll save a lot of money that way. Free food and drinks in these seats are also a bonus. WestJet flies 1 versions of Boeing 737-800.